This wine list cover uses the same rugged, man-made material commonly found in the book-binding industry. 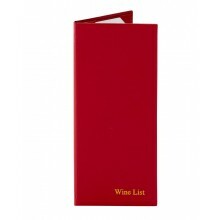 Using a complementary color we print “Wine List” in the lower right-hand corner at no charge. This text is always printed onto this product - even if in the “Artwork Options” section below you choose to have your product delivered blank (i.e. without your own artwork). To obtain this product with absolutely nothing printed onto it, please order the blank Standard Hardcover Menu Covers.